Viet Thanh during her valiant struggle. Some of the best lessons I’ve learned about leadership have come from my failures. Here’s a story of a big one. 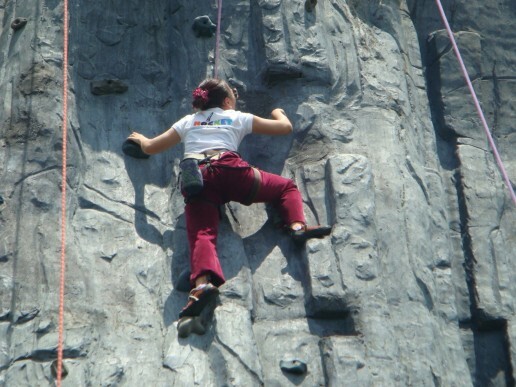 One brilliant, sunny day a few years ago the directors in our team went rock climbing on a team-building activity. 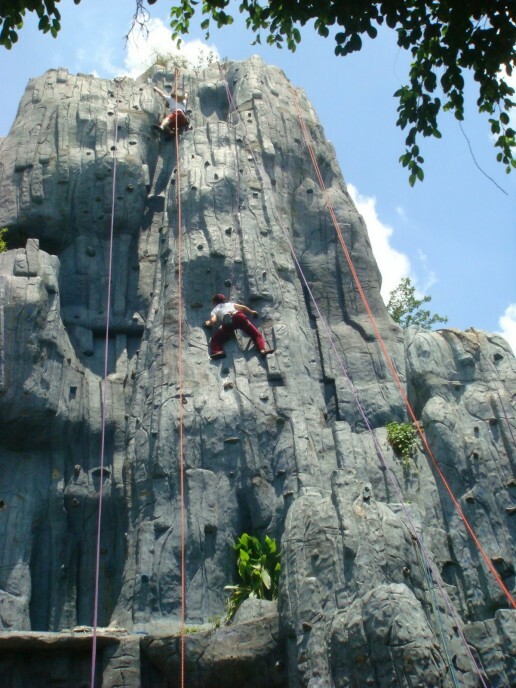 The climbing wall was about 20 meters (60 feet) high, an imposing dull grey edifice studded with multi-colored climbing grips. We craned our necks looking up at the thing as the staff briefed us. Two people at a time could climb. A few people scrambled to the top as the rest of us shouted our encouragement. We cheered wildly when they conquered the silent grey giant and rappelled back down with triumphant grins. I was pumped with determination and adrenaline. My hands were clammy with sweat. My heart beat like a drum. I began pulling myself up the wall. About 12 meters up I made a mistake and looked down. My head swam. My mind raced. I pushed the fear back to the periphery of my mind like a campfire pushes back the night. My arms and legs had become leaden weights. My fists refused to clench. I continued climbing. The encouraging shouts of my colleagues below spurred me on. The top was within my grasp. I summoned a final surge of will. Me (left) and Viet Thanh (right). I’m almost there but have lost sight of my most important mission. The top! The grey giant lay broken and shattered beneath me! I rappelled back down through the soft air, flush with victory. Smiles and high-fives all around. Then I turned and looked back at the wall. My heart sank. I realized that my victory was hollow in its selfishness and vanity. For halfway up the wall, exhausted but still struggling valiantly, was one of my team members, Viet Thanh. She had started at least twenty minutes before me. I had zipped by her and didn’t even notice, focused as I was on my own goal. We tried the best we could to support Viet Thanh from the ground. But it was too late. She was discouraged and had no strength left. Five minutes later she gave up and was lowered to the ground. Her face grimaced with exhaustion and disappointment. Viet Thanh unhooked her harness. Her accusing gaze fell upon me. “You didn’t support me, Chris.” It was a statement of fact. My face reddened. A burning sense of shame welled up inside. A lump appeared in my throat. I’ll never forget the lesson I learned that day. A leader never focuses on himself to the exclusion of his colleagues. A leader never forgets that his primary responsibility is helping others to achieve their goals. And a leader never, ever abandons his colleagues. A leader stays with them until the end. He encourages, coaxes, fights and suffers side by side with them until the job is done. I love this story Chris, it’s really a big learning about leadership, even it’s just a rock climbing. A leader cannot succeed while his staffs fail! Thanks Hang. You’re right — a leader always makes sure his people succeed. My failure on the wall was a very important lesson for me. One of the most important lessons that Chris showed to young leaders in Navigos that I remember by heart: NEVER LEAVE YOUR TEAM MEMBERS ALONE! Reading this article remind me of another leadership lesson you taught me indirectly. There was a time in my management career, I made mistake in people management & that caused the team in danger. In stead of reprimand, you & Wee Tee have stood by my side, got my back & provide guidance to help me solve the problem. 2 years later, when one of my leader fell into the same situation, the leadership example that you & Wee Tee did have help me a lot in guiding him overcome that. I believe that Wee Tee & your leadership example will follow me & my leader to help many others in our management career. Yes, I remember that Bich Nga. The best thing a leader can do when one of their people make a mistake is to forgive them. The leader also should ask “What did you learn from this mistake?” The biggest mistakes are also the biggest learning opportunities. When managers punish people for making mistakes they create an environment where people are afraid to take risk. Of course, a leader should not tolerate the same mistake over and over because it means the person is not learning. Glad to see that you have grown as a leader!! I’m proud of you em.